Image: Arche #21 cover by Pete Woods. The past few issues of Archie have been gripped by “Over the Edge,” an event that has brought Archie and Reggie’s bitter rivalry to a crisis point, but leave a beloved Riverdale citizen on death’s door as well. Now, speaking to series writer Mark Waid, io9 can exclusively reveal whose life hangs in the balance. Seriously, if you want to wait for tomorrow’s Archie #21 and its huge reveal, turn back now. 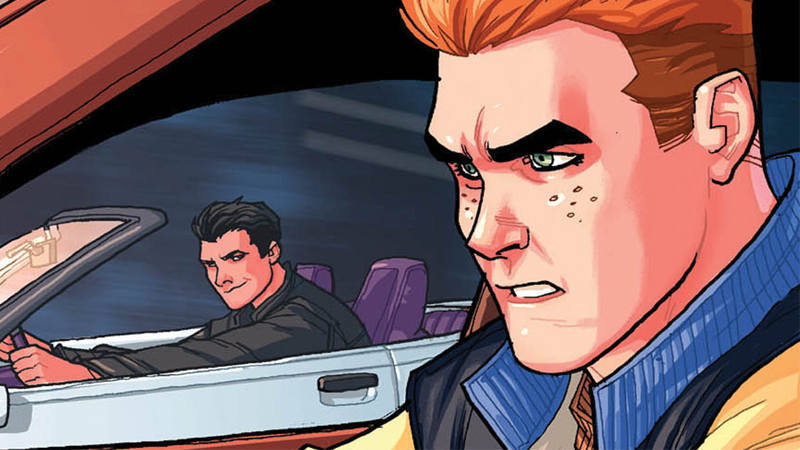 “Over the Edge” has so far seen Archie and Reggie finally agree to a do-or-die showdown as their longstanding rivalry simmered over into outright hostility: a no-holds-barred drag race at the ominously named Serpent’s Hill. Knowing full well Archie is thoroughly unprepared for such a race, Betty takes chase in her own car to try and knock some sense into the two boys... only to find them mid-race and, after skidding on a sneakily placed oil slick by Reggie’s cronies, helplessly careening head-on into a deadly three-car pile up between the teenagers. Archie #20 ended with the horrifying crash itself, but io9 can now reveal that Archie #21—by Mark Waid, Pete Woods, and Jack Morelli, on shelves tomorrow—will reveal that the accident has left Archie and Reggie physically unscathed, but reeling at the fact their race has left poor Betty Cooper at death’s door. We sat down with Waid to discuss what Betty’s fate means for Archie and the gang and even Riverdale at large going forward given the tragic events of “Over the Edge”—check out the full interview below as well as an exclusive preview of the issue, depicting Jughead, Veronica, and several other Riverdale citizens’s initial reactions to learning that one of their own is near death. io9: How did you come to decide that Betty would be the one facing death in this storyline? Mark Waid: It needed to be someone whose life touched the lives of the other characters in a significant way. We certainly could have put, say, Dilton or Archie’s dad in harm’s way, but not every other character interacts with them on a day-to-day basis. When you think of “One will die!” storylines, a comic like Archie isn’t the first thing that comes to mind. Why did you think now was the right time to do this story with Betty? Waid: We’ve had a great deal of success (and I’ve had a great deal of fun) rebuilding the Riverdale universe these last two years, and now that we’ve finally put all the characters on the table and given them depth, it felt time to ramp up the stakes. Teenagers (speaking as a former one) do dumb things all the time, but rarely do we see the consequences of their mistakes on this dire a level. Archie has done tragedies on this level before, but they’re always out of main continuity. What was the pressure like pitching this storyline knowing how it would impact on the current Archie universe in such a huge way? Waid: It’s funny, because I feel like I’ve spent more time explaining that we’re NOT killing anyone than talking about the real story here—which is to showcase how these characters handle themselves under extreme, stressful circumstances. This is a story about what happens when we make small, poor decisions and they end up having big ramifications. I’m more interested in showcasing how these characters evolve and respond to tragedy than just killing someone off for the shock value. I don’t want to spoil how for readers, but the way Archie #21 builds up to the reveal of Betty’s condition is brilliantly done. Did you always plan for this issue to build up the way it does, or were there earlier versions of how you framed the moment of truth before settling on this? Waid: To be honest, no matter how tight my outlines, the ideas I sit down with are almost never the ideas that make it to the page. No plan survives first contact with the enemy. I tend to find the story as I write, and the way the reveal is handled was a bolt of inspiration that, halfway through my script, came from re-reading a bunch of old Archie stories and clocking their rhythm—then tearing up the floorboards and starting again with that in mind. Speaking of which, What does a Riverdale without Betty Cooper even look like? How long will it be before we see the reaction of the town at large to what’s happened? Waid: Oh, not long at all. That’s really the point of this story—to demonstrate that Betty Cooper is the Heart of Riverdale. As we’ll see, dozens and dozens of Riverdale residents depend on Betty and her good works as a volunteer and caretaker. Her loss will be felt immediately. Betty and Veronica are one of the most iconic duos in comics—how will she react to what’s happened to Betty? Waid: If she were evil, she’d just be glad there was no more competition for Archie’s attention. But that’s not our Veronica. She’s going to be spending some time dealing with how a girl with infinite resources can feel so helpless in the face of this tragedy. How will the gravity of Betty’s situation affect Archie and Reggie’s tumultuous relationship going forward, given their involvement in the accident? Waid: There are only two things keeping Archie from beating Reggie to within an inch of his life. One is that Archie’s dealing with not only his grief but with everyone else’s. The other is that the waiting line for exacting vengeance on Reggie is very, very long. If this really is the end of the line for Betty, what will be the thing you miss when she’s no longer a physical presence in the series? Waid: I love (loved?) Betty’s complexity. When we reintroduced our cast back in the first issue, we established that Archie and Betty had been a couple but had broken up. Throughout the rest of the series, Betty has had to come to grips with how she really feels about Archie: Does she still love him, or is she simply reacting to the perceived threat of Veronica, or is it even more complicated than that? If you’re looking for a lens through which to view romance in Riverdale, it’s not Archie, it’s Betty. “Over the Edge” continues with Archie #21, in stores tomorrow, June 21.